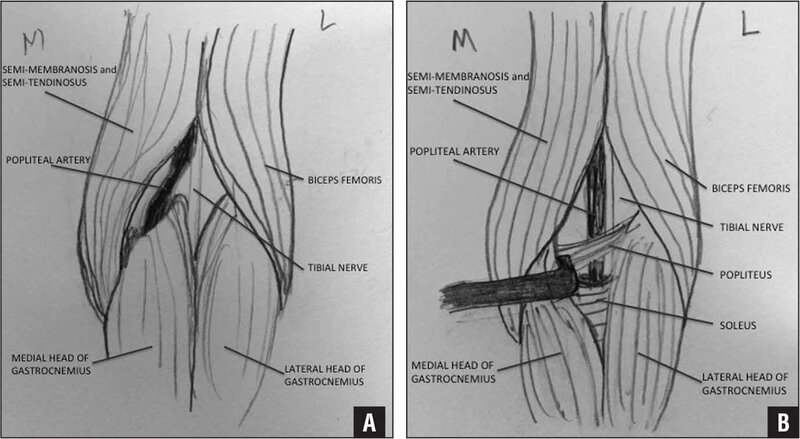 Illustrations of 2 types of popliteal artery entrapment syndrome. The popliteal artery has an abnormal course due to the origin of the medial gastrocnemius (A). With the gastrocnemius retracted, the soleus sling or hypertrophy of the popliteus could compress the artery (B). A 20-year-old female collegiate lacrosse player presented with diffuse bilateral posterolateral pain in her legs during exercise that had progressed to unbearable shooting pain. She reported burning sensations and muscle cramps after running. Symptoms were exacerbated by increased activity and especially by running up stairs and ankle plantarflexion. Occasionally, she noticed paresthesias in her plantar foot as well. The pain in the calf and the foot was also present at night. Symptoms progressed such that they prevented her from playing lacrosse or running short distances. Her physical examination yielded essentially normal results, with no contributory findings. The patient had been seen by 2 other clinicians prior to presentation and had been diagnosed with medial tibial stress syndrome and chronic exertional compartment syndrome. Magnetic resonance imaging, performed to rule out stress fracture, did not reveal any unusual anatomy. Her condition did not improve with treatment, including rest from sport, stretching, and dedicated physical therapy, for these diagnoses. A trial of gabapentin did not relieve symptoms. Additional workup, including compartment pressure measurements at rest and after exercise, completed prior to her presentation to the authors' office had negative results for exertional compartment syndrome. After sufficiently ruling out compartment syndrome and because of the nature of the pain, the authors performed dynamic ultrasound. This revealed bilateral popliteal artery entrapment, showing loss of popliteal arterial flow with plantarflexion against resistance bilaterally. The left popliteal artery in neutral and with plantarflexion showing decreased flow is shown in Figure 2A and Figure 2B, respectively. A magnetic resonance angiogram showed compression of the popliteal vessels during dynamic plantarflexion (Figure 3). Dynamic ultrasound of the left popliteal artery in neutral (A) and with plantarflexion against resistance showing decreased flow (B). Preoperative axial magnetic resonance angiogram just distal to the knee joint showing the popliteal artery (arrow) in neutral (A) and mild narrowing of the popliteal artery (arrow) in the anteroposterior dimension in plantarflexion (B). No anatomic abnormality of the musculature was identified. Patients with popliteal artery entrapment syndrome typically present as described above, with calf or lower leg pain that is sometimes accompanied by paresthesias of the posterior lower leg or foot. Clinical evaluation should entail detailed observation and palpation of the lower extremities for pain, swelling, ecchymosis pulses, and deformity. Pulses are normal at rest if occlusion, which is a late, severe finding, has not occurred. Symptoms have sudden onset, are usually precipitated by episodes of intense physical activity, and may last well after activity has stopped. Additional reported symptoms include cramps in the calf and the foot, coldness, blanching, and numbness. The sudden onset of severe, disabling claudication in a young adult without atherosclerotic risk factors is highly suggestive of popliteal artery occlusion due to entrapment. The differential diagnosis includes tibial stress fracture, medial tibial stress syndrome, exertional compartment syndrome, and metabolic disorder of muscle. 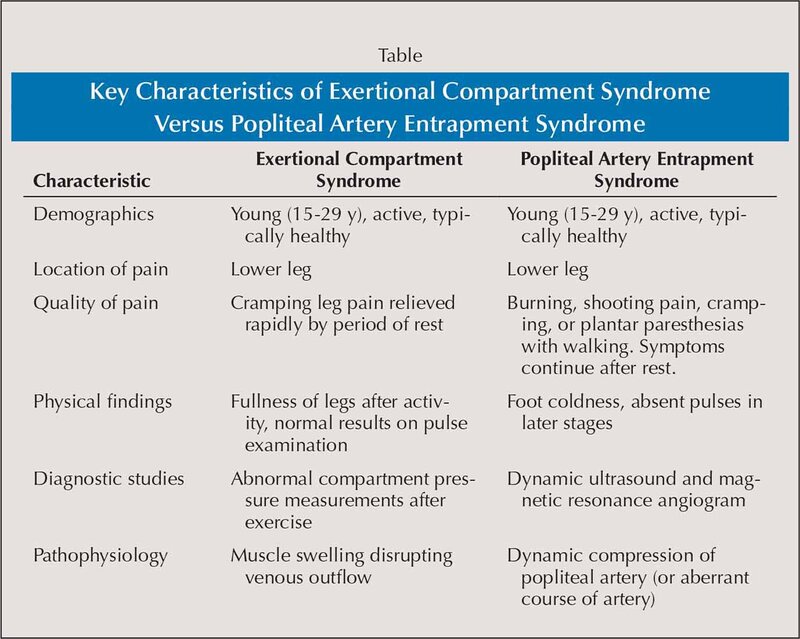 It may be most difficult to distinguish popliteal artery entrapment syndrome from exertional compartment syndrome. Key characteristics of both are listed in the Table. Surgical management requires release of extrinsic compression to preserve or restore arterial flow. For more severe cases involving arterial damage, bypass may be necessary. Some authors have described posterior approaches2; however, the current authors prefer a medial surgical approach to release, which was used in the current case. An incision, approximately 8 cm long, was made 4 fingerbreadths below the medial joint line in a longitudinal fashion. Dissection was carried through the skin and subcutaneous tissue until the fascia overlying the gastrocnemius and soleus in the posterior compartment of the leg was visualized and then incised. The pes anserine tendons were left intact, and the gastrocnemius muscle was retracted posteriorly to visualize the soleus muscle. The crescent-shaped sling of the soleus muscle that surrounds the popliteal artery, popliteal vein, and tibial nerves was released. The plantaris tendon was also visualized and released. Palpation was performed to assess adequate release around the gastroc–soleus sling and the plantaris tendon and to ensure that the popliteal artery, popliteal vein, and tibial nerve were extensively freed. Postoperatively, the patient was instructed to elevate the bilateral lower extremities as much as possible and to keep compression on the area to decrease swelling and allow for wound healing. She followed gradual return to exercise, with progression to a stationary bike between 2 and 4 weeks postoperatively. Eleven months postoperatively, she had returned to full activity and collegiate lacrosse and was symptom free. Physical examination showed full, pain-free range of motion at the knee and the ankle and soft, compressible leg compartments. The patient had normal dorsalis pedis and posterior tibial pulses with both ankle plantarflexion and dorsiflexion. Four years postoperatively, the patient continues to do well and has unrestricted full activity. Various diagnostic modalities, including the following, are available for evaluating suspected popliteal artery entrapment syndrome: (1) post-exercise treadmill test, in which vigorous activity identifies and reproduces symptoms; (2) Doppler ultrasound imaging/ankle–brachial pressure index, which assesses for the disappearance of pedal pulses when the patient plantarflexes against resistance4,5,11,12; (3) dynamic ultrasound, which visualizes occlusive disease, abnormal course, or aneurysmatic changes with ankle motion5,8,12; (4) arteriography (provocative and static), which is considered the gold standard4,5,11,14; (5) cross-sectional magnetic resonance imaging/magnetic resonance angiogram, which provides a detailed evaluation of musculotendinous and arteriovenous anatomy in the popliteal fossa5–7; (6) computed tomography/computed tomography angiography, which analyzes the anatomy of the popliteal artery4,5,14; and (7) intravascular ultrasound, which assesses the extent of popliteal artery compression, confirms the length of compression and luminal narrowing with provocation, and assesses the arterial lumen for intimal change and potential irreparable vessel wall damage. This report has described a case of bilateral functional popliteal artery entrapment syndrome and its successful surgical management, which allowed for a pain-free return to full, high-level sport in a young patient. Popliteal artery entrapment syndrome is a rare but important cause of peripheral arterial insufficiency. Young patients with intermittent claudication should be carefully evaluated for this disease because early diagnosis and surgical intervention are important for good outcomes. A delay in surgical treatment may result in worse outcomes, including aneurysm or thrombosis. Stuart TP. Note on a variation in the course of the popliteal artery. J Anat Physiol. 1879; 13(pt 2):162. Iwai T, Konno S, Soga K, et al. Diagnostic and pathological considerations in the popliteal artery entrapment syndrome. J Cardiovasc Surg (Torino). 1983; 24(3):243–249. Chang MD, Steer A, Perera W, Robinson DR. Bilateral popliteal artery entrapment syndrome secondary to anomalous lateral heads of gastrocnemius [published online ahead of print March 11, 2015]. ANZ J Surg. doi:10.1111/ans.13047 [CrossRef]. Quality of pain Cramping leg pain relieved rapidly by period of rest Burning, shooting pain, cramping, or plantar paresthesias with walking. Symptoms continue after rest. The authors are from the Department of Orthopaedic Surgery (HTH, LKS, KMS) and the Department of Surgery, Section of Vascular Surgery (BES), Yale University School of Medicine, New Haven, Connecticut. Correspondence should be addressed to: Karen M. Sutton, MD, Department of Orthopaedic Surgery, Yale University School of Medicine, 47 College St, New Haven, CT 06519 ( karen.sutton@yale.edu).